“I’m really proud of the way the guys played. That’s about as good as Montréal’s going to get, and we’ll be better next time,” said Stingers head coach Gerry McGrath. Moments before the game started, the 3,000 people on hand realized that Mackay would sit out the match due to a minor concussion suffered in the Stingers’ first game at Bishop’s. That meant back-up QB Terrance Morsink got the nod from McGrath. “We weren’t going to take that chance [to play Mackay] because we think Terrance can play at a high level and he did today,” McGrath said of Morsink, who threw for 236 yards—one more than his Carabins counterpart Alexandre Nadeau-Piuze. Stingers second-year punter Dumitru Ionita got his team out of countless predicaments, averaging 44 yards with his drives on the day. The Carabins took the first lead of the game on a 31-yard pass from Nadeau-Piuze to receiver Frank Bruno with 4:06 left in the first. Concordia was able to hang on from then until the fourth quarter, allowing just two field goals from Montréal kicker Alexandre Sy. The turning point almost came with 14:36 still left in the game. Trailing 14-1, the Stingers had the Carabins pinned on third down at their own 33-yard line. Without much of a choice, Montréal elected to punt, only Sy’s attempt was good for a mere 17 yards. Led by Morsink, who found out he’d be starting Saturday morning, the Stingers then got to work by putting a string of first-down passes together. “Terrance did a great job and he certainly didn’t take away our chance to win,” said McGrath. After finally reaching third down, kicker Rene Paredes was summoned to attempt a 28-yard field goal, but it was blocked. The Carabins tried to get going with the subsequent drive, but it was apparent they were becoming vulnerable. With 10:33 left, Concordia began a drive at centre field. All it took was one pass for Morsink to find wide-open receiver Sanchez Deschamps who snuck down the right side of the field for a 55-yard touchdown. The Carabins would escape, however, as Rotrand Sené and Garlins Duclervil returned two fumble recoveries at 3:56 and 3:02, respectively, for the 29-8 win. “The momentum shifted and we couldn’t get it back,” said Morsink following the game. Saturday marked his first start in Canadian Interuniversity Sport football. 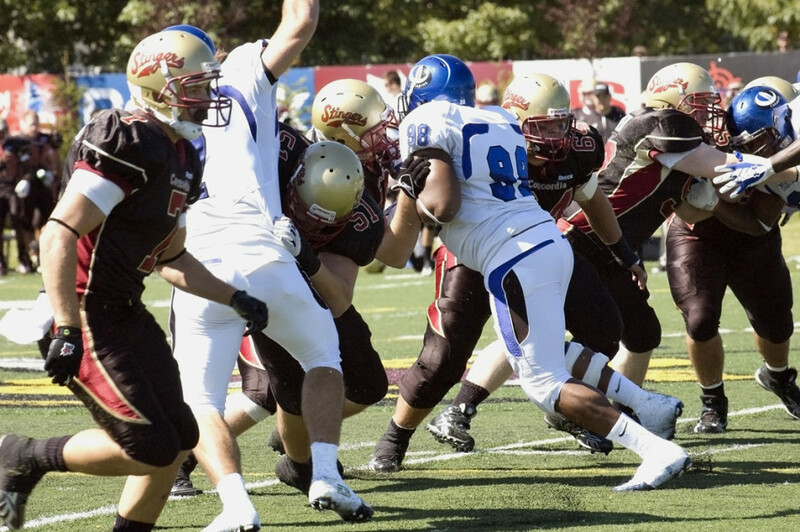 In terms of rushing yardage, the Carabins posted 256 on 39 attempts to Concordia’s lowly 30 on 21 attempts. Montréal was penalized 14 times for 213 yards, while Concordia conceded eight penalties for 110 yards. The Stingers will cross town for their next encounter, which is scheduled for this Friday, Sept. 17 at Molson Stadium against the McGill Redmen at 7 p.m.